One of the questions Tricia asked the panelists during the From A Certain Point of View panel was what we most enjoyed about Star Wars. 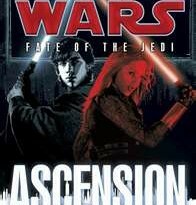 Before Celebration Anaheim, I had a fairly stock answer: the movies, of course, especially IV, V, VI; some of the EU novels, especially Timothy Zahn’s; playing SW:TOR; and the interesting people I’ve met. What I realized at the convention was that really, truly, what I love most about Star Wars are the other fans. 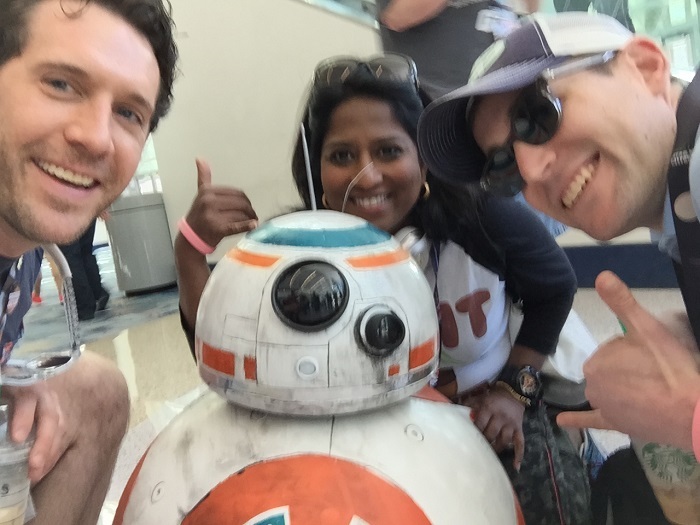 I met quite a few interesting people at Celebration Anaheim, and in this series of posts I would like to share their stories with you. When I first met Charlie and Chris, I thought they were two hapless business travelers accidentally booked into the Anaheim Marriott during Celebration. Who could blame me? 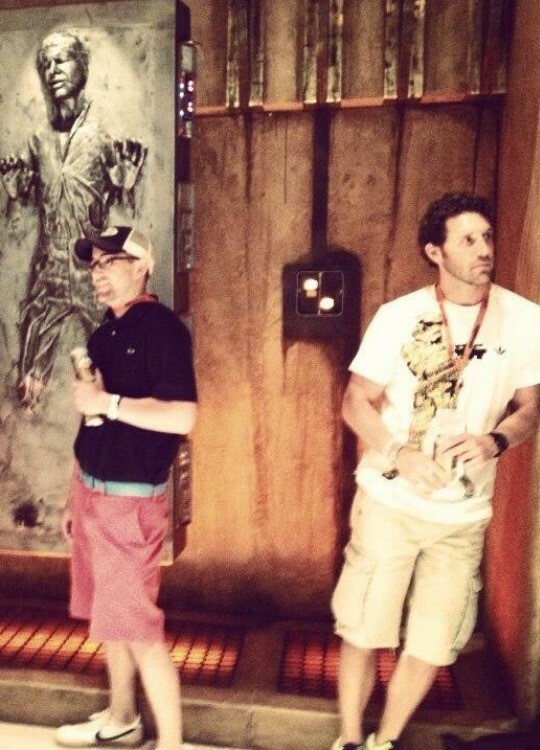 Chris was dressed in Vineyard Vines and Charlie was not wearing his white Stormtrooper watch yet. How wrong I was. The two have been friends nearly twenty years, bonded through Star Wars. Together, they have been to every Celebration since III. I liked Charlie and Chris immediately. They know their Star Wars, they’re funny, intelligent, and articulate. Charlie and I spotted a Stormtrooper in a kilt and had the same immediate, classic kilt question. You know the one. That was the moment I knew we were destined to be friends. Over the long weekend of Celebration, I got to know them better, not just as fellow fans, but as the kind of companions who don’t shy away from honestly talking about and supporting each other over the gamut of what life has to offer and the deep, hard stuff life throws at you. I kept running into Chris and Charlie throughout Celebration, so much so that it seemed synchronistic, at critical times when it was especially good to be with friends. 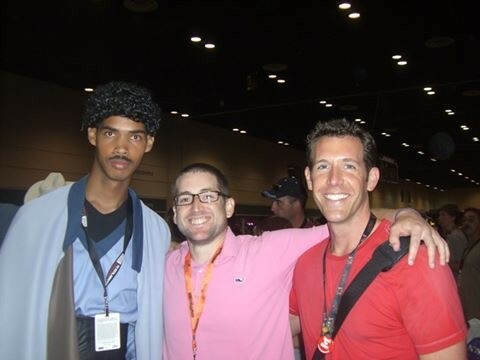 For example, it was Charlie who spotted Ray Park at the Marriott. Charlie and Chris may think they are like a famous pair of droids, but hanging out with them, I felt like Mara Jade backed up by the Hand of Judgment. How did the two of you first discover your mutual interest in Star Wars? Charlie: Chris and I met as freshmen in college. That being almost 19 years ago, the specifics are a bit foggy. I’ve been a lifelong collector, so I’m pretty sure I flew the Star Wars flag in some form or fashion in my dorm room. It may have been a collapsible lightsaber or an Artoo on my windowsill. It may have been my OG Star Wars bed sheets that tipped him off. But I do know it wasn’t long before we were having in-depth conversations about how much the Holy Trilogy dominated our lives. What began with Chris’ philosophical musings of why a Fett bucket tattoo on my shoulder was the only way to go evolved into even more meaningful situations, such as camping out in front of the Hollywood 27 for 36 hours for Episode I tickets. Chris: As Charlie described, the details of how we first discovered each other’s love of Star Wars have become fuzzy over the years but the impact of the discovery has been lasting to say the least. One of the things that Charlie didn’t mention that resonated with me was how unusual and unexpected it was to find someone who openly loved Star Wars as much as I did. 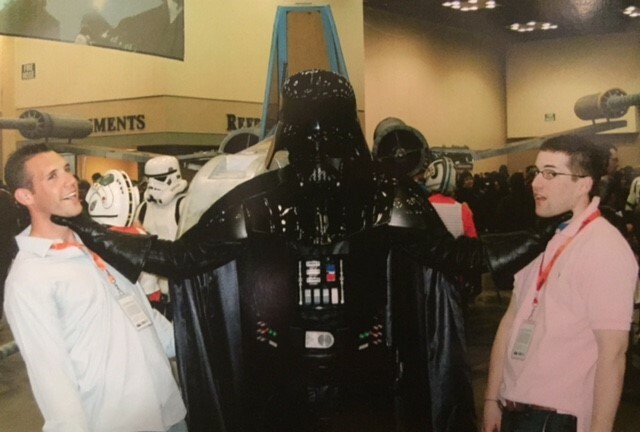 We started college before “geek chic” was a thing and the prequels, which brought a lot of fans out of the closet so to speak, were still a couple years away. It was great to find someone who not only loved Star Wars as much as I did but who loved it in the same ways and for many of the same reasons that I did. How did Celebration become your way of getting together? Charlie: It started with Celebration III in Indianapolis. We’d somehow known nothing about I or II and had actually fallen off a bit on staying in touch after school, so this was a pretty big reunion. I was in the Navy living in San Diego; Chris was, best as I can recall, involved in drift racing in Tokyo or something. We both got a message about it since we were Hyperspace members at the time, and the flurry of emails began. With all its flaws, Celebration III ended up being amazing, and the experience is what created this as an ongoing event for us. Celebration at Celebration, seeing ol’ tiny boots George Lucas, waiting in line overnight for the store, the exclusive Vader figure (that we were going to save and retire on when it became so valuable that it made a telescoping lightsaber Vader look like a ’95 gym rat Vader), the first bottle opener magnet…. All played their parts. Celebration reinvigorated our friendship and has played a strong, supporting role in it ever since. Chris: Celebration III happened at kind of the perfect time for us. Charlie was in the Navy and I had just moved from Tokyo to Baltimore (Sayonara Lil’ Bow Wow!). Our lives had changed in a lot of ways in the five years since we had graduated from college and Celebration III offered the perfect opportunity to reunite for a common love. I remember the same highlights Charlie mentioned but he conveniently left out one of my most cherished memories: when Charlie nearly flattened Billy Dee Williams! To be clear, it wasn’t on purpose and everyone ended up escaping unscathed, but to this day it brings a smile to my face every time I think of it. We have gotten together for each of the Celebrations since and each has served as sort of a milestone in both of our lives. What did you both enjoy the most at Celebration Anaheim? The least? Waiting in line is an accepted part of Star Wars Celebration, and honestly it can even be fun if prepared for and executed properly. The live streaming and online coverage were huge leaps forward for this event and helped make waiting in line a little more tolerable. I’ve always felt like there were enormous gaps in what I was able to take in from Celebration; not this year. All major panels were seen in one form or another. I felt relatively complete on Sunday afternoon. Massive shout out to the pin trading; that was a blast(er)! 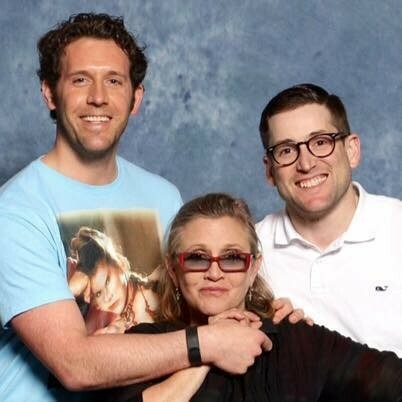 Hugging Carrie Fisher has to get a mention. Least is not so tough. The store took a huge leap back. The event’s getting larger, but we’re sticking to the same format of aimless wandering through the store and waiting in line for a handful of cashiers? Sweet. For the next Celebration, I’ll get my “line starts here” poster board out of the garage from TPM. Are we not at the point where we can pre-order merch and have a pick-up location? Or how about thirty cashiers? Also, if something sells out on day one again next time, I’ll lose it (especially if it’s the same damn thing for three events in a row – I’m looking at you patches and pins. Here’s a hint: ReedPop. Those are popular). Chris: There were so many great things about Celebration Anaheim that it would be impossible to choose my favorite. I would definitely echo the positive things Charlie listed and add some praise for the location itself. I think we both loved O’Lando for Celebrations V and VI, but Anaheim was even better. From the weather, to the food trucks, to the proximity to Disneyland, Anaheim was an overwhelming success as a host city as far as I am concerned. Once again, Charlie was absolutely on point with his criticism of the Celebration store. Not only was it poorly run, poorly stocked, and criminally overpriced, the bottle opener magnet (the one souvenir I cannot live without) was an abomination. Also, I’m still wondering what we did to deserve having to sit through James Arnold Taylor’s voice actor sizzle reel on a continuous loop for four straight days. How did you get into Star Wars—the movies? An animated series? The books? Which is your favorite? Has your friendship changed your interests? Charlie: I’d have to say this is a combination of both action figures and the movies. My brother is a few years older than me and saw ANH in the theater, and it changed his life. He immediately had to have some of the original figures, and he played with them nonstop. One of my earliest memories is of him watching ANH on HBO at my grandmother’s house while playing with some of the figures. I was hooked. I’m not sure if my obsession was due to admiration of my older brother or if it was simply innate brilliance. Either way, I was playing with a Millennium Falcon before I understood what a hyperdrive even was. It wasn’t long before I made him take me back multiple times to see ROTJ in our local theater and Mom buy me a speeder bike for Luke to saber in half. Please. Empire. I don’t think I need to expand on this. From there, my love for the saga expanded to the universe and then to the community. I’m a big fan of a number of the books – particularly ones that develop the story around the era of the OT. I’ve also collected the comics for years. It was tough to say goodbye to Dark Horse, but it’s nice to see the license back with Marvel where it belongs. I’d say that my friendship with Chris has enhanced my relationship with Star Wars in a major way. I’d never had serious conversations about the mythology of the saga, the intent of the characters, or even why I even cared so damn much. Hell, we still have regular discussions on which order we’d show the films to our children (and why we didn’t think of machete order first), on why the first Death Star orbited its way to the Rebel Base instead of shooting its way to Yavin, on the validity of the Battle of Endor, on how much we legitimately hate midichlorians, on the fact that one of us has to be Mr. Plinkett and just isn’t telling the other one, and on “killing in white uniforms.” You know . . . the basics. Chris: I came to Star Wars through the movies and that is where my fandom remains firmly entrenched. Of course, I played with the toys, some of which (the plush Wicket that helped me stop sucking my thumb, the Millennium Falcon from my Uncle Billy, the X-wing my mother gave me on Valentine’s Day, etc.) have very strong sentimental value to me today. My favorite movie is, of course, Empire. I will acknowledge that there are a few days of the year when, if you catch me in just the right mood, I would choose A New Hope but today is not one of those days (and tomorrow probably won’t be either). In terms of my interests outside of the movies, I have read some of the books (I particularly enjoyed the Thrawn trilogy), watched The Clone Wars animated series, and check out Star Wars Rebels from time to time, but my attachment to Star Wars remains firmly entrenched in the movies, particularly the original trilogy. My relationship with Charlie has enhanced and expanded my love of Star Wars. We have deep, meaningful conversations about Star Wars that often lead to discussions of really meaningful aspects of our personal lives. In fact, there have been many occasions when conversations about important events and issues in our own lives have ended up with an analogy to something from Star Wars that sums up how we’re feeling, how best to handle a situation, and either elevates our enjoyment of something that is already positive or helps to put a positive spin on something that undoubtedly needed it. Do you participate in fandom in any other ways? Charlie: As I mentioned before, my love for “toys” began with the Kenner figures long ago, and that tradition was reinvigorated in the mid-‘90s with the re-launch of the line. My interests have now evolved to more high-end collectibles, and I’ve become a regular offender with Gentle Giant and Sideshow as well as some low run art (while I have to say, it’s hard to not stop and smile at a good 3¾” when I pass by). This fixation has introduced me to a whole new community of fans, and I have thoroughly enjoyed this new outlet for my passion. As a relevant side note: a great centerpiece to my “museum” has to be a specific lightsaber with a plaque on it that reads “On loan from the collection of Mr. and Mrs. Christopher B.” It adds a certain prestige to the room. Thanks, buddy. Chris: My love of Star Wars is so innate and Star Wars has been a wonderful part of my life for so long that it seems funny to think of myself as participating in “fandom.” Upon further reflection, I guess I don’t really participate in fandom in the ways that so many of the awesome people we have met at Celebrations over the years do. I love and respect the 501st (shout out to the MidSouth Garrison!) but I don’t do cosplay; I was so impressed by the writers we had an opportunity to meet and listen to in Anaheim but I don’t blog or write fanfic; I continue to be amazed (and more than a little bit envious) of the Artoo builders but I don’t build droids either. I guess I do participate in collecting, at least vicariously. I am the self-appointed curator of “The Charlie C. Collection,” Charlie’s “museum” of awesomeness. My duties as curator generally include such tasks as telling Charlie that a certain piece is “the coolest thing that I have ever seen,” trying to keep the focus of his collecting efforts on Star Wars (though I have to admit that his Marvel and DC collections are outstanding as well), and repeatedly talking him into buying just about everything, irrespective of the price. As Charlie mentioned, my wife and I are also “benefactors” of the The Charlie C. Collection. If you could be any Star Wars character, who would you be? What would you guess Charlie/Chris would be? Characterizing Chris as a single character is difficult as well, but this time I’ll try and play by the rules. As a friend, Chris is loyal to a fault. He’s the sort of friend that’s always there to talk you off the ledge but never judgmental about it. He’s also the kind of person that’s “always there.” When I think of great stories or fun memories from our overlapping past, they almost always include Chris; while he may not have created some of the situations, he had some direct impact on the outcome! As a professional, he is diligent and a perfectionist and his work product is a reflection of that. He is proud of his accomplishments and rightly so, but the bottom line is that you can trust his timelines and his quality. As a family man, he is fierce. When it comes to his brood and those whom he considers family, he runs directly into the fire to be sure they are protected. To me, all of this is the embodiment of R2-D2. Stay with me. For a character that we’re never close to 100% sure what he’s even saying, we’re always 110% of his intent and his soul. A more loyal character, a more present character, a more competent character or a more brave character the Star Wars universe does not have. I believe this is why the little droid is so universally loved. Find someone who will say something crappy about him, I dare you. 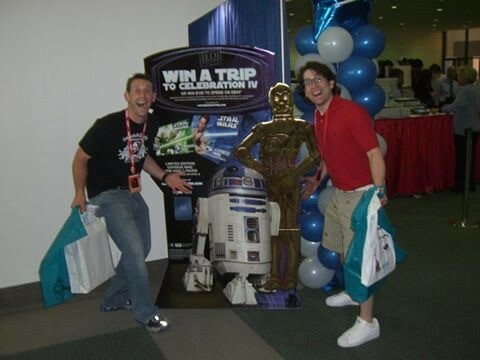 Chris: Over the past 20 years or so my connection to and love for Star Wars has become so inextricably tied to my friendship with Charlie that it’s hard for me to imagine either one of us as a Star Wars character outside the context of our friendship. We are absolutely as close as Han and Chewie but our relationship has a different dynamic than those two. We’ve been friends for a long time and (we’d both like to believe) we’re as charming and handsome as Han and Lando but, if either of us had been in Lando’s shoes, Vader could’ve force choked every last Ugnaught and Boba Fett could have shot Lobot right in the cybernetic implants before we would have sold out the other. If you had asked me this question five years ago, I would have said Han (Charlie) and Luke (me) but today, my answer has changed. C-3PO is fluent in over six million forms of communication and Charlie can talk to and connect with anyone. He is genuine, friendly, warm, and witty, a wonderful combination of characteristics that has served him very well both personally and professionally. While I almost invariably hold back, Charlie’s engaging, accepting, and open, encouraging me to reconsider playing the message. C-3PO is not only enormously loyal, he is unwavering in his forgiveness of others. Charlie has similar traits and has stuck by me as a friend even during times when I undoubtedly didn’t deserve his loyalty. Why he sticks his neck out for me so regularly and so readily is far beyond anyone’s capacity! Charlie is a god to little furry creatures. What would you like to see in the future of Star Wars? Charlie: This has been a big topic of discussion for the two of us in recent months. The universe could expand exponentially in the EU without much concern to us. 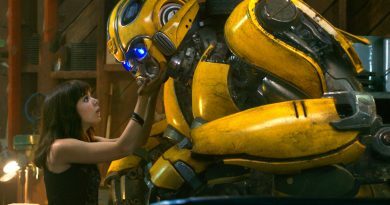 It didn’t feel “real.” With all Disney’s plans for the “big screen,” now we’re paying attention. Am I excited? Hell yes. But I’m also wary. There’s no denying that the saga is important to me, and nothing could ever take that away, but I want the future silver screen endeavors to add to the franchise’s mystique, not detract from it. I love the idea of building on the foundation of what’s already there; telling stories that fill in gaps or support the mythology. The concept of the Anthology films is great, but if we end up with a movie on the rise and fall of the Modal Nodes, we’ve gone too far. 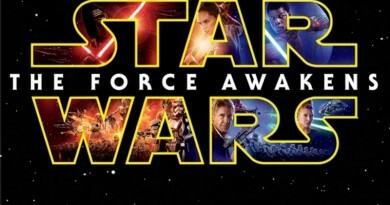 A film a year could be a burn rate that Star Wars can’t support. That’s scary to me. Then again, I could just feel burned from the last time we had a new movie. If/when TFA knocks it out of the park, I’ll be back to making “The Line Starts Here” signs on poster board. Keep in mind, this is coming from someone whom has a pair of Death Star “fuzzy dice” hanging from his rear-view mirror, so my room to judge Disney on its potential commercialism is a garbage masher with the walls already on the move. Chris: What I would like to see from Star Wars in the future is a return to the magic that made Charlie, me, and all the people we’ve met at Celebrations fall in love with Star Wars in the first place. Star Wars has brought together so many people from so many different walks of life and that is one of the most wonderful things about it to me. If the future of Star Wars is movies of a quality on par with the prequels or a money-grabbing oversaturation of the market, I’m afraid of the impact it will have on a community and, indeed a culture that I so dearly treasure and hope my 13-month old daughter will want to share with me as she grows. I would also like the future of Star Wars to include one last special edition in which midichlorians are officially and emphatically removed. In all honesty, I would watch a Lord of the Rings length trilogy about Jar Jar Binks every Tuesday for the rest of my life if it meant I could cleanse my brain (and my soul!) of midichlorians. What does being a Star Wars fan mean to you? Charlie: To sum it up: It means being part of a community. I think that’s why Celebration is so important to me. It doesn’t matter what segment of fandom is important to you, you’re part of the family. For some time, it may have seemed silly to openly express that notion, but thankfully that time has passed. Freddie Prinze, Jr. said it best this year on the Rebels panel, and I’m paraphrasing: “My Mom told me, ‘They’re going to make fun of you for something anyway, so you may as well do what you love.’” Damn right, FPJ. Damn right. Chris: Charlie and Freddie Prinze, Jr.’s mom said it better than I ever could! Will we see you at another Celebration? Charlie: Now that we’ve finally figured out how to dominate these things? Without a doubt. Each one we’ve been to has had a markedly different feel to it. With Celebration Anaheim, I think we finally hit our stride. I cannot wait to see what the next Celebration has in store.